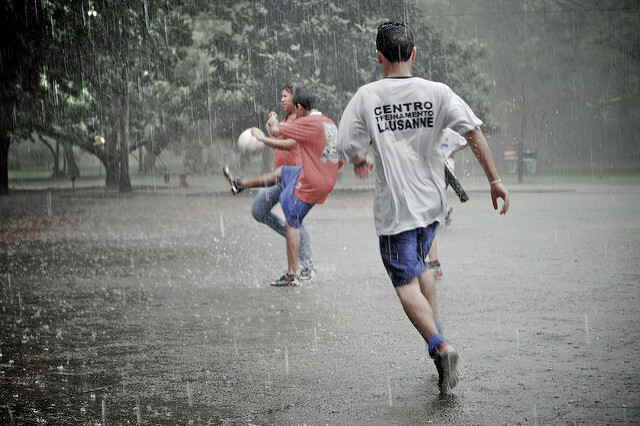 When was the last time you played in the rain? I love rainy days because they give my girls and I the perfect opportunity to have fun and learn new things. According to Alfred Wainwright, "There's no such thing as bad weather, only unsuitable clothing," and I totally agree. Here are nine ways your family can join us in pouring some fun as you play and learn in the rain. You could stay inside and watch TV the next time it rains, but I prefer to exercise outside. Most kids need at least one hour of physical activity every day, so don't let the weather keep your kids inside. Slip into your rain boots, grab your rain coats, and take a walk in the rain. It's good exercise and gives your kids a fun chance to explore the neighborhood as they enjoy the weather. Last week, the rain turned our street into a small river. We grabbed our paper boats and raced them to the intersection. Your kids can turn leaves, sticks, bark, and other objects into boats, too, as you look for flowing water and enjoy a little friendly competition. Wet dirt acts differently than dry dirt, and playing in the mud makes people of all ages happier, healthier, smarter, and more flexible, creative, and connected to nature. Grab your beach tools the next time it rains and discover the benefits of mud as you and your kids create works of art. What fun mud-castle designs will your kids create on a rainy day? All kinds of critters scamper around during rain storms and immediately after the rain. Head to the woods or your backyard and look for squirrel, worm, deer, and bird tracks. Your kids can earn extra credit if they find and correctly identify the tracks they see. What sports do your kids like to play? Try playing those games in the rain. Talk about how the ball moves differently when it's wet or how you have to be a little more cautious when running on wet grass as you have fun playing soccer, football, tag, or tug-of-war during a rain storm. My girls don't usually need an excuse to dance, and we certainly take advantage of the rhythm of the rain to get creative. We make up our own jigs, get silly, and have fun dancing. Your kids can, too, when you host a dance contest outside in the rain. I'm always amazed at the changes rain makes to the objects I see every day. Take time during the next rain shower to compare and contrast the differences and similarities between wet and dry days. You'll have fun exploring your backyard or neighborhood as your kids practice the art of observation and hone their detective skills. Who says you can't paint in the rain? My girls and I have used powdered paint, food coloring, and washable markers to create works of art in the rain. It's fun to be creative in a different environment and to see the effects of raindrops on different paint media and paper types. When my girls were little, they never missed an opportunity to jump in puddles. Now, we all get in on the action when it rains. We jump, hop, skip, gallop, and run through as many puddles as we can. It's a ton of fun and helps us stay active no matter what the weather is like. The next time it rains, head outside with your kids. Try one of these nine suggestions or create your own list of outdoor activities as you pour some fun and learn new things.